The career of the British rock great and MOTT THE HOOPLE icon Ian Hunter is celebrated with this 30-disc Anthology box set, Stranded In Reality, containing a swathe of rare and previously unreleased recordings and film. Compiled and curated by Ian and recognised Hunter-MOTT biographer Campbell Devine, the project is the ultimate celebration of the artist’s hugely influential and sparkling solo work. Covering the years 1975 to 2015, Stranded In Reality comprises 17 original albums on 19 CDs, 9 “new” discs of intriguing rare and unreleased tracks plus 2 DVDs. 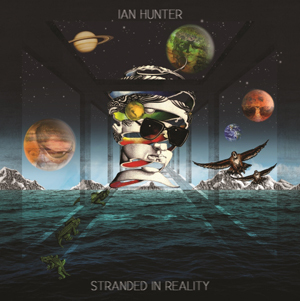 All of Ian’s classic solo albums are contained in the box set including expanded Anniversary Editions of Ian Hunter, All-American Alien Boy, You’re Never Alone With A Schizophrenic and Welcome To The ClubShort Back N’ Sides, All Of The Good Ones Are Taken, The Artful Dodger, Strings Attached, Shrunken Heads and When I’m President. The new albums are titled Tilting The Mirror (Rarities 2CD), If You Wait Long Enough For Anything, You Can Get It On Sale (Live 1979-81 2CD), Bag Of Tricks (Live Volumes 1, 2 and 3), Acoustic Shadows and Experiments. The box presents many unheard and “lost” songs from Ian’s archive including "San Diego Freeway", "Nobody’s Perfect" and "Salvation" as well as rarely performed live versions of "Wild East", "While You Were Looking At Me", "The Outsider" and a 2008 acoustic concert.